Not included in the transaction was a footpath that led from the road, that is Am Sandwerder now, to the water’s edge of the Wannsee. For your orientation, the exact location of this footpath is the ramp that runs along the side of the boat houses we knew from the Rec Center days. However, Dr.Oppenheim did purchase this strip of land later in 1904 from Prinz Leopold. The transaction carried with it a supplementary condition that various members of Prinz Leopold’s family continued to have the use of the footpath. This group was living in the immediate neighborhood of Am Sandwerder. This condition was formally written into the title register (Grundbuch) of the real-estates around Am Sandwerder.4 The laymen interpretation is that whenever the titles of these parcels of lands change hands, the entitlement to the use of the footpath goes to the new title holder. Well, the prescient among you can see that AIYCB has to deal with this issue nearly one hundred years later! 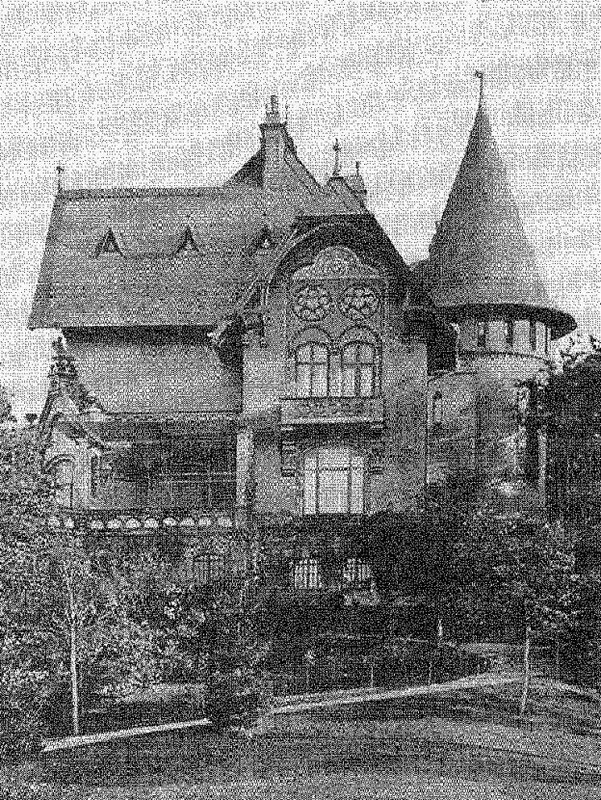 The property had a new owner in 1925, another wealthy banker Hans Arnhold. Occasionally I see the name written as Arnold, but I think it’s incorrect. Mr. Arnhold commissioned the architects Lessing & Bremer to convert the residence into the form that we know now, i.e., all traces of the neo-Gothic style were erased. A boat house was constructed by Areal GmbH in 1930. The title of the ownership was transferred to the Arnholdsche Verm ̈ogensverwaltung (Arnhold Assets Administration), i.e., in trust, for Mr. Arnhold’s daughters, Ellen and Anna-Maria. Please make note here that these names will return to the scene. In 1938 Mr. Arnhold, because he was Jewish, was forced to sell the property on Am Sandwerder for a token price to the German Ministry of Finance. The Arnholds moved to Paris, and subsequently to the US. The ownership changed title again in 1942 to the Deutsche Reichsbank. The Minister for Economic Affairs, Mr. Walther Funk, as the President of the Reichsbank took the property as his official residence. Mr. Funk was later tried, convicted, and sentenced to life imprisonment by the Nürnberg Tribunal. He served ten years of his prison term in Spandau Prison from where he was released due to ill health. He died in Düsseldorf in 1960. The US Forces paid a rent of 3,347.00 Reichsmark per month for the use of the property until it was reclaimed by the former owner, the Arnholdsche Vermögensverwaltung in 1950 under a ”restitution claim”, i.e., settlement to aggrieved property owners. In October 1951, after settlement by the courts, the property Am Sandwerder 17-19 was officially returned to the Arnhold Estate. As the estate received a token price for the property in 1938, it was necessary to repurchase the property from the Berliner Zentrallbank, the custodian of the Reichsbank. The US Forces continued the rental payments to the Arnholdsche Verm ̈ogensverwaltung, Mrs. Ellen-Maria (Arnhold) Gorrisen, and Mrs. Anna-Maria (Arnhold) Kellen, until the property was released in May 1953 back to the owners. The Arnholdsche Vermögensverwaltung offered the use of the property to the German authority. The Berlin Senate accepted and used it from 1953 to 1956 to accommodate refugees from the East. From 1959 to 1982, the US Forces invested $185,962 (X 2.5 DM = 464,905 DM) on capital improvements and maintenance, i.e., heating system conversion, installation of underground cables and water pipes, swimming pool, extension of marina facilities, and the building of boat houses and bathrooms. During 1988 to 1990, the US Forces spent approximately DM 9 million for major reconstruction and renovation of the main building of the villa.1 One should take note here that the Berlin Wall came down in 1989, and the US Forces were conscious of the fact that their days in Berlin were numbered. During the entire period when the US Forces had the property of Am Sandwerder 17-19 under requisition, the entitlement to use the footpath from Am Sandwerder to the Wannsee by the various property owners around the neighborhood was suspended. After Jan 1, 1994, when the US Forces officially departed from Berlin, all the interested parties in the neighborhood wanted their entitlement restored. We held the key, literally, to the gate that gave outside access to the footpath. The neighborhood group demanded from us the immediate distribution of keys. While not disputing the entitlement to access the footpath, we were extremely unhappy about some of the demands put before us by the neighborhood group. The entire legal fight centered on two concepts – in German, the Wegerecht and the Mitbenutzungsrecht. The former means the entitlement to use the footpath in order to get to the water’s edge. The latter means, over and above the Wegerecht, the entitlement to make use of the area of the footpath in other private forms, e.g., building structures there, large and small, for boats and other objects. We believed that the Wegerecht was the original intention and agreement between Prinz Leopold von Preußen and Dr. Oppenheim. If we conceded the Mitbenutzungsrecht, then the footpath would become in some form a ’joint’ property between us and the neighborhood group. The ensuing horror-situation would be that we could not decide unilaterally how we could use the footpath. We told the neighborhood group that we would not distribute any keys for the gate if they insisted on claiming Mitbenutzungsrecht. Keys would only be handed out when each recipient signed an acknowledgment that they agreed to accept the interpretation of the Wegerecht. This provoked angry letters from a few in the neighborhood group. One even threatened to go to court in obtain an order to knock down a boat house because the width of the boat house had encroached on the footpath. A court case of one form or another seemed to loom, and as such one was never too sure about the outcome. We engaged our own lawyer, Dr. Peter Meyer, who researched into the history of the contract between Prinz Leopold von Preußen and Dr. Oppenheim. He laid out the clinching arguments that were based on Prussian laws concerning waterfront properties and access to the water. These were communicated to the neighborhood group in 1995 and were accepted. Hurrah, we won without going to court! Without realizing it at the time, we had also won for the American Academy that would take over the premises after 1998. Nowadays, we remind our members as often as we have to, that strangers might sometimes wander from the footpath on to our club property. We would politely tell them that if they were not members of the club they should remain on the footpath. At least our worst fear has not been realized, i.e., drunken youths crawling all over the place. I said that the German Federal Government, as represented by the Oberfinanzdirektion, bought the ground and the villa from the Arnholdsche Verm ̈ogensverwaltung (Arnhold Assets Administration). Around the time of 1992/1993, our club’s name was changed from AYCB to AIYCB, and the club was for the first time a legal registered sport club in the German Vereinsregister (register of association). With this new name and legal status we contacted the Oberfinanzdirektion and the Berlin City Authority and conveyed to them that whatever plan either of them had for the villa, the AIYCB wanted to rent the marina facility. We were contacted by the Berlin City Authority6 that we could go into negotiation with them about a rental contract. In subsequent meetings with them, we heard that there had been an exchange of real estate properties between the Federal Government and the City of Berlin. The latter had become the owner of the real estate. It was the informal intention of the City that the villa and the ground that goes with it should somehow be involved in some yet-to-be defined German-American activity. Although the way the villa might be used was entirely unclear, we, the AIYCB, filled the bill. In time he found the villa waiting to be occupied. Contrary to what he wrote,7 ”it was a run down mess, unusable.”, the villa had an expensive refurbishment at the beginning of the ’90s, in fact 9 millions DM between 1998 and 1990 as stated in the preceding text. I was not the only one in the club who wondered at the time why they had not stopped the renovation, since the military had been scheduled to leave. The work had to be paid for by the German taxpayers, this writer included. Maybe ”unusable”, because before the military withdrew entirely from the city, word had gone out to other US military establishments that furniture of all kinds was to be had for free from the Officers Club (Harnack House) and other places like the Rec Center. So, for example, the one-year old stainless steel kitchen in the Rec Center (the villa) was unscrewed from the wall and trucked in its entirety to the another Rec Center in southern Germany.8 That German tax payers paid some of the expenses of the four ”occupying” Allied forces in Berlin belongs to the arcane history of the cold war and the status of an occupied city that was Berlin. Richard Holbrooke discovered that the previous owners of the villa, the descendants of the banker Arnhold were still alive, living in New York and still in the banking business. Richard Holbrooke called on them in 1996, and thus, the idea of a German-American cultural exchange academy with its base at the villa on Am Sandwerder was born, with an initial generous seven figure donation from the descendants of the Arnhold family and further funds raised from corporations. This is quite a touching story of how one family’s history has come around full circle. The part of the Arnhold family that Richard Holbrooke visited in 1996 was the daughter Anna-Maria Arnhold of the once owner of the villa Hans Arnhold. She has been married to a German emigre’ banker Stephen Kellen since 1940 and they have been living in New York ever since. Her donation came with a wish that the grounds should be restored to what they were like in the ’30s when she grew up in the villa. More of this below. After the Arnhold family left Germany in the ’30s, they started a new merchant banking firm in New York that today still bears the name ”Arnhold and S.Bleichroeder”. Hans Arnhold recruited his son-in-law Stephen Kellen to oversee the US business. Stephen Kellen was actually born to the family Katzenellenbogen in Gross Kamin that is now ten miles inside the Polish border. From all reports he seemed to have been the tower of strength behind putting the American Academy on its feet. He himself admitted that he is emotionally tied to the cities New York and Berlin. He passed away in 2004 in New York. How did The Academy became our landlord ? Simple ! The City of Berlin leased the villa and the rest of the grounds to the Academy for a nominal sum. We have become the sub leaser. Our present 13 years lease will run out in 2013, but an extension of the lease is expected. Between the US military vacating Am Sandwerder 17-19 on Dec 31, 1993 and the Academy taking over the premises in 1998, one of our club members, Horst Seifert, was asked by the Senate of Berlin to keep an eye on the essential utility structures of the villa on the premises, e.g., winterizing the villa. Horst was absolutely the right person for this because he was the Harbormaster of the Rec Center. AIYCB club members also contributed by clearing the fallen leaves from what are now the Academy’s lawn and the drive during our spring and fall clean-up weekends. The relation with our landlord was not always smooth sailing at the beginning, although one can look back with humour at some of the incidences of friction we had. For example, shortly after they moved into the villa, they announced that they were planning to knock down the toilets that we used. This was a way to fulfill the wish of Mrs Anna-Maria Kellen that the grounds should be restored to its ’30s look.The toilets actually stood outside the boundary of the yacht club’s area. That motivated us to build our club house extension with new toilets and shower facilities. Well, the old toilets to this date (2011) are still standing ! When we showed the Academy our plan for building the club house extension, their architects objected to the tower because they claimed that it’s size would block the Academy’s view of the Wannsee. To convince them that it was not true, we put up a true-scale wooden frame at the place where the tower would be. They approved in the end. 2. Michael S. Cullen, in the newspaper Der Tagespiegel, November 6, 1998. 3. Jörn Bahn, Johannes Otzen 1839-1911, Priester Verlag, Mu ̈nchen, 1971. 4. Rechtsanwalt Peter Meier, private communication with AIYCB. 5. Mrs Anna-Maria Kellen, private communication, August, 2006. 6. AIYCB correspondence with various external parties. 7. The Berlin Journal, a periodical published by The American Academy Berlin, Am Sandwerder 17-19, 14109 Berlin. 8. Quincy Liu, private contacts and conversations with the Recreation Center personnel. 10. Fritz Stern, Gold und Eisen. Bismarck und sein Bankier Bleichröder. Ullstein, Frankfurt am Main 1978, ISBN 3-550-07358-5; Neuausgabe: Rowohlt-Taschenbuch-Verlag, Reinbek bei Hamburg 1999, ISBN 3-499-60907-X. 11. AIYCB contacts with the American Academy.